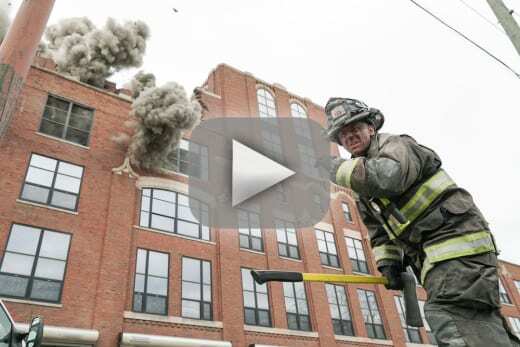 Tragedy strikes again on Chicago Fire Season 4 Episode 22. Jimmy's brother was kind of a douche, but he still didn't deserve to have a building collapse on him. Jimmy is understandably upset right now and not thinking clearly, but here's hoping someone talks some sense into him before he runs head first at Boden. Danny should have gotten out of there when Boden gave the order, but he chose to stay, and that's on him, not Boden. It's especially tragic that he didn't actually hear anyone in there, but he still died a hero. What would Jimmy have done if Boden had allowed squad to come in and someone else had died? He'd be blaming himself, which he basically is anyway. Not for his death but for not helping him out earlier with the liquor license. He now has something in common with Chili since they both lost siblings this season. Let's hope this doesn't lead him back to her. No one wants to see her again. Dawson's quest to foster Louie went downhill, and then back up again. Antonio's trying to be the protective big brother, but he doesn't actually have any idea what is going on with these two. If it were up to Casey, they'd probably be married by now. Dawson wasn't ready yet. Of course, now that the possibility of fostering Louie is back on the table, that could all change. She would have a much better shot with Alderman Casey on board, especially if they were married. It could all be a moot point, of course, because the promos for Chicago Fire Season 4 Episode 23 show Dawson's life in danger. Not that any of us actually believe she could die. So will they end up getting married and fostering Louie? It's not really the best reason to get married. Sure, they love each other, but it wasn't long ago Dawson was saying she was happy with things as they were. Casey hasn't forgotten that. The comic relief came from the guys pulling a fast one on Otis. They convinced him he needed to "woo" Connie with a theater date in order to ensure his job would be waiting for him when he returned. Being that Otis is on medical leave and part of a union, I have a hard time believing his job would be in jeopardy, or that he would believe it was. It was funny and all, but it didn't really make any sense. The baseball comparison is definitely not the same situation, though a player hurt under contract still gets paid. The new guy was good looking though. If anything, Severide's the one with competition. Of course, Kidd's ex picks this opportune time to resurface and profess his love for her. Severide acted all nonchalant about it at the bar, but you could tell it phased him. Kidd claims she's not interested in him, that she's just "worried" about him, but nothing good can come of that. She needs to cut ties and move on. He's not her responsibility anymore. So is Jimmy going to fall off the deep end? Will Dawson end up with the adorable Louie? Hit the comments with your guesses! 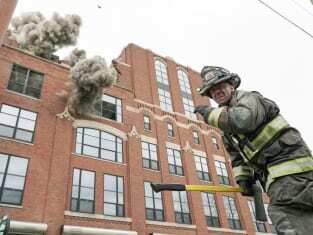 If you need to catch up before next week's season finale, you can watch Chicago Fire online!